Having organized and conducted the first successful project – spring educational expedition on The First Summit, we decided to go on. Read our story about the first summit here. This article deals with the second summit. And we have just started to prepare to the third expedition. If you want to join us, find the contacts in the end of the story. The Independence Day of Ukraine was drawing near and we wanted to spend these three days off not just boozing, but profitably and interesting. And in such a simple way we have got the first constraint of the project – the term of the expedition itself and duration of our preparation for it. The second constraint we took from the first project – we had a shortage of mountain altitude, so we had to choose the highest among 2.5-thounders. 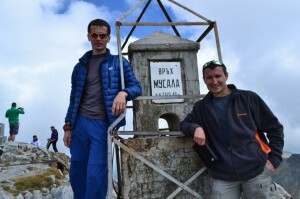 Musala Mount , the highest point of Bulgaria, turned to be the suitable summit (2925 m). The third constrain we have thought up ourselves being guided solely by our greed – we had to meet the limited budget of 300 dollars apiece. Create a single page for a single project, for example in Google. Here you can also store the documents. It’s very important when managing a project team virtually. We had a definite period for preparation – just a month – to organize the ascent in a foreign country, where none of the participants had ever been before. We created a project page on Facebook and downloaded the documents on Google Drive as well as the last time. Then we took the documents from the first expedition and quickly created the similar ones according to requirements of the new project. We got the Project Charter, Expedition Procurement Management Plan and Expedition Communications Management Plan. All published documents connected with our expeditions are constantly available on: facebook.com/groups/7PMSummits/files. Logistics – Kyiv-Sofia-Kyiv – elaboration and purchase of the tickets. Purchasing the missing equipment and ammunition. This time we decided not to use SmartSheet and simply created a schedule file in MS Project Professional 2013 and shared it for the working group on Google Drive. The result was “cheap and nasty”, i.e. not very handy. So SmartSheet still continues to hold the leading position in my personal ranking of cloud software for managing the small projects. This wasn’t an advertising, but my personal experience. Unfortunately, no one, but ourselves, sponsors our expeditions yet. We arranged the sequence of preparation for the expedition according to cost value. We reckoned that the way to Bulgaria and back would “bite” the biggest part of the budget. Our visas would cost a bit cheaper, but they also would take an essential part of our money. And the expenses for accommodation and transport in Bulgaria was the third, the smallest part of the budget. The private car – this way was almost as expensive as a transfer by plane (the gasoline is expensive abroad and we have to pay the road charges and a transit charge). The bus and the train – cheaper but longer. We don’t have so much time. And in addition the travel by bus is wearisome – to spend a day and night sitting on the bus seat. At the end we have chosen the plane – WizzAir flights: Kyiv Zhulyany – Sofia and Sofia – Kyiv Zhulyany. It was perfect for us, because Airport Zhulyany was in Kyiv and Sofia Airport was also within the city. But we faced with one problem – there weren’t return flights on August 26. That’s why we have bought the return tickets on the 27th of August, but that was already a working day. The plane arrives at 16:25. While we would pass through the custom and got the baggage, we couldn’t come to office even by the end of the working day. So we decided to consider deeper out time limit for 3 days. Why did we set such a restriction? Because we wanted the expedition not to intersect with the main job. 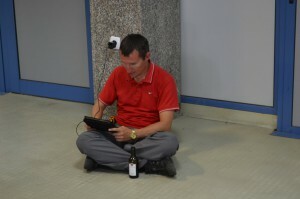 And what if we find a way how to “be in the office”, being in Bulgaria at the same time? How? Very simple! 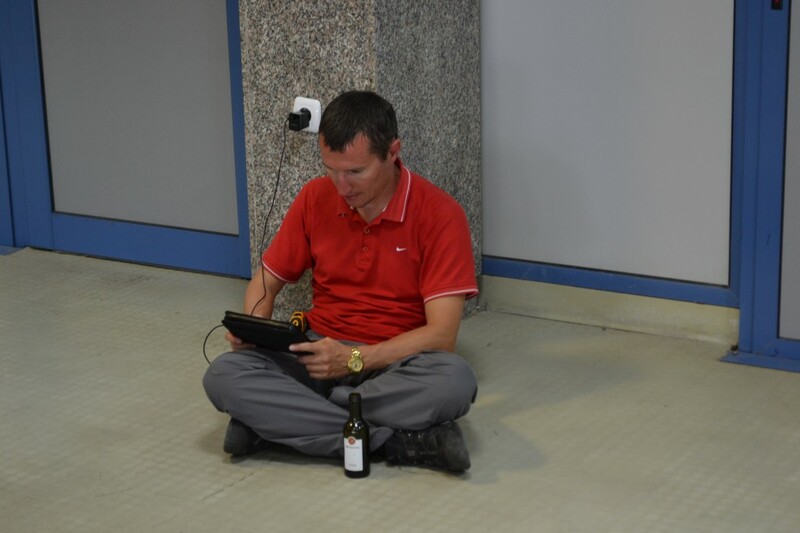 We just had to find the good Wi-Fi and a socket in Sofia Airport or somewhere in the neighbourhood. Luckily there are MS Lync, MS Exchange and other stuff for remote work in the office. We can call to the office and throughout Ukraine, answer the letters and organized the meetings… But this would add to our luggage extra weight due to our laptops/tablet PCs and the battery chargers, which we couldn’t leave in the camp unattended and would have to take them to Musala. The roundtrip tickets price was $173.5 per a person. So we had the balance of $126.5 apiece. The visas was the next big expense line. And here we have seen in action the classical positive risk which was called as an “opportunity” in the last PMBOK. It turned out that I didn’t need a Bulgarian visa because I had a Schengen multiple entry visa. I’ve made an inquiry to the embassy and got such reply: “The Embassy of Bulgaria pointed out that the applicant may remain on the territory of Bulgaria up to 90 days within each 6-month period, without Bulgarian visa if he or she has a valid Schengen multiple entry visa, national visa of EU Member State or a residence permit in one of the Schengen Union countries. The total number of days allowed to stay in the European Union isn’t deducted from visa”. The only difficulty was that the insurance were required for both, who just making visa and who have already had it. We were told that the insurance police would be checked upon arrival to the country (by the way it was untrue). We decided not to risk and quickly bought the simplest travel insurance in Ingo Ukraine. When asked: “Will it be just tourism or you will do something extreme”, – we replied: “Just a tourism”. The price paid – $5.4 per a person. So we had $121.1 balance apiece. When we prepared all the documents for the visa, it turned out that consular agency didn’t accept the printout about hotel reservation from booking.com. It was the first Change Request! So we had somehow to get the booking confirmation on the hotel letterhead paper. We emailed and called to Bulgarians, but they were as responsible as Ukrainians… So we had to suffer and spend the extra money. There was Consulate of Bulgaria only in Odessa and we had to submit the documents in Kyiv through the visa center. So our extra charges included €35 – consular fee for visa, €22 – service fee of the visa center, €30 – advanced payment for accommodation and €9,51 – charge for SWIFT-payment to Bulgaria. In total: €96.51 or $128.2. That was exactly what we had done! Now imagine that an engineer gets such a document (or even better, he creates it himself) and performs all his technical work correspondingly. The sequence of actions is modeled in details. The possibility that he won’t be able to perform the work is minimal, and even if something goes wrong, the maturity of the thoughts and ideas of this engineer about this work is so high, so he will be able to find the bypass way very quickly and perform the task. If a person has modeled everything in this head, he has already covered most of the problems and come up with solutions – he has just to implement them. I have a good friend from Lviv. When she was a school-girl, they were divided into groups of boys and girls at the lessons of basic military training. The boys were taught to fire, to march, to assemble and disassemble a machine gun, etc. And the girls had first aid trainings. But my friend didn’t want to be a nurse, she wanted to shoot and to assemble-disassemble a machine gun. She wanted it so much, so she remembered the posters from the room for basic military training and every evening, going to bed, she “practiced” the assembling and dissembling of AK-47 assault rifle in her mind. After a while the teacher of military trainings got the quota: “Choose two boys and two girls from a school for City Competitions”. He began frantically search for girls who could even approach the machine gun. He has found only one biathlete girl and my friend has volunteered herself. When the teacher asked them to practice, she showed him an excellent result, having hit a military standard. The teacher was shocked! It was a Soviet times, Lviv, and you know, that rumors that every third Hutsul family had a Schmeisser, tucked away somewhere, weren’t groundless. So the teacher asked her very cautiously: “May be you have a machine gun at home?” “No”, – she replied and told him a story. Today she is a professional certified project manager. And at off-laze time she works on her PhD in the project management. This is a really good parable showing how it is useful to model the future performance in mind. And the idea has the ability to materialize! Three days before departure, we had a Go/No-Go Decision meeting. It was formalistic because everything was ready. It remained only to conduct the expedition. Jokingly we called it Go-Go-Go Decision. As the budget of our project was almost over, however the expedition even hasn’t started yet, we decided to save money and bought some foodstuffs in Ukraine. We took the standard touristic set – packed meals, Snickers, tinned goods. I remembered that it’s prohibited to carry the touristic bottled gas in the plane. That meant that we had to deviate from the route, find a tourist shop in Sofia and buy some gas. So we had to use the time reserve, allocated for unforeseen circumstances. Luckily we have investigated the transport schedule from the airport to the foot of Musala Mount from the time of landing till the night. But it got worse and worse as it went on. Our plane departure was delayed by 10 minutes. So we arrived 15 minutes later, that’s why we missed the bus to the city, the next bust should come only in 30 minutes. While we were hunting through the shops to find the bottled gas, the heavy rain started. We used it as an occasion to buy a 3G-card. In general, while we waited till rain stopped, bought the card and adjusted it, we have accumulated the total schedule delay in 1 hour. Due to this we missed the last shuttle bus Samokov-Borovets. So we had to go by taxi that resulted in extra expenses in 4 levs (3 dollars) apiece. After that the budget balance was 23 dollars apiece. The taxi driver tried to settle us in a hotel for 20 lev per night, spinning us the yarns that there weren’t campsites in Borovets. But I took out our printed Plan of actions and showed him an address and a telephone. He dialed the number and unwillingly took us to the camp. The “help” of the taxi driver didn’t bring him an additional income and our budget remained unscathed. The Plan worked! It was thundershower in Borovets. We put up a tent in the rain. Then we sat in it. Having made a short “attack” on the nearest store, we “procured” a bottle of Bulgarian red wine. The dinner was cooked also in the tent. We were waiting till the rain stopped and drank wine. When the rain stopped, it was already dark, but we went to look for a chairlift to Yastrebets Mount. Having find it, we checked the opening hours and cost of lifting. All aligned with our expectations to a second and a stotinka. The Plan worked! On foot along the path to the Musala Hut. 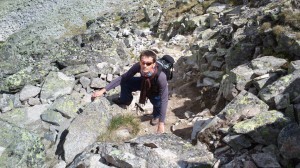 Further in the direction of Aleko summit to the lakes at an altitude of 2545 m.
Then we passed the lakes and went strictly upwards on Musala (2926 m). As we have planned, at 12 o’clock we were on the summit. The project objective was achieved! And it this moment we have made the biggest and the most common mistake in the project management – we have loosened up. 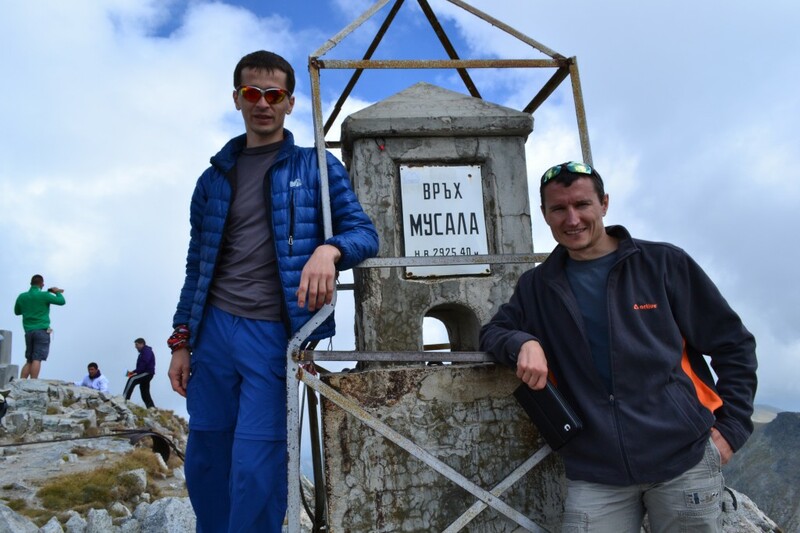 We planned to go back along the route: Malka Musala (2902m) – Irechek (2852m) – Deno (2790m) – Shatrr (2495m) – then to turn left at Sladkata Voda, not reaching the summit of 2208 m, and get to the chairlift “Sitnyakovo Expres” (1778 m) and lift down in Borovets (especially since we have a ticket for the climb and descent). In the beginning everything was great. The trail was difficult, almost vertical in some places, but there were the stretched steel cables. So we moved forward quite cheerfully and quickly. But then the path trail became periodically to disappear and appear again. In two hours it disappeared completely. Moving on benchmarks we wandered into so dense juniper, so we couldn’t move along the mountain range any longer. It was a high time to use our 3G-card, which we bought during the rain. We downloaded Androzic, examined the map and our GPS-coordinates. The trail has gone sharply to the left toward the river long ago. If we went along the line, we would get to the mountain side. We were sure that there would be a great view on Borovets from there, but it wasn’t clear how to go down from the rock, so we decided not to check this way. We also didn’t want to go back and we had two hours before the chairlift closing hour. So we have chosen the only wrong decision – to go down to the river straight through the juniper wood. With each step down the juniper became higher and reached a height of 2-3 meters. We could move only stepping on the trunks of lower trees while holding on the branches of the upper trees. The main thing was not to fall down between the trees and not to get on a dry juniper. If you fell down, at first you hurt yourself badly against some stuff and screwed the arms, and then you lost a lot of time to shimmy down through the tree branches and to climb on the top. If you got on a dry juniper, you fell across the large and small branches, which have been turned into sharpened swords and spears by a harsh mountain wind. We have chosen the second one, because we simply had no strength to run. We took off the clothes and freshened up in the river. I have found the juniper needles even in my shorts. And it wasn’t one or two needles; it was a bunch of them. We took some water in the same river. We were so thirsty, so nobody cared for insanitary conditions. We washed up, rested, took bite and slowly moved down to Borovets. We got back to the camp at 7 p.m., after 10 hours and 25 km’ walk along the mountain trails and without them. The rest of the evening we did nothing, just sat and talked, and went to bed early. In the morning we moved towards Sofia. The rest was according to the Plan. And if there were some deviations, they were made deliberately. In the afternoon we walked around Sofia. And in the evening we gave praise to the gods of the Project Management – we drank wine and ate meat. Bulgaria is a cheap country. The “praise” cost us 19 dollars per a person, so each of us had $4 of unspent budget. The Project Management rules! The next day I wanted to check whether the security system would notice the touristic bottled gas, packed in an iron shell of JetBoil. Noticed! For the second time in my life I was convoyed into the airport’s depths for taking out the bottled gas. And, as always, WizzAir was delayed. So we arrived to Kiev with a 1.5 hour delay. The mountains are the energy accumulators, and the man is a transformer. If you go to the mountains, you have to be able to transform the energy they give you. If you don’t transform it, you don’t get any benefit. We had to wait 1.5 hours in the terminal before departing from Zhulyany. We think, we can come for registration later because it makes little sense to be the first in line to boarding. Pay extra care to time when using the low-cost airlines. For example, out flight from Sofia to Zhulyany was delayed for half an hour. It’s advisable to carry about small change. For example, we faced with a problem wen paid the taxi driver. We told him that we almost had no money (so that he didn’t “cheat the price”), but when it came time to pay, I felt stupidly taking 100 Euro from the pocket. If you are going to use the public transport, it will be better to form not only time schedule of the transport route but also to know the list of stops for better orientation. We included the time for 3G-card purchasing in our Plan, but we didn’t considered that we would spend about an hour setting the gadget. Pay attention to the stresses in the foreign names (of the summits, hotels, places, etc.) We didn’t know at first that the right name of the summit was MusalA, and not MusAla. Pay the particular attention to the navigation matter. Ideally – to have a separate device. We have started the preparation to the third summit. The next summit will be bigger but not in height, rather “in contents”. We are going to conduct a winter climbing in the Carpathian Mountains, or in the Crimea. In addition to the study of project management methodology, we want to practice climbing skills – walking in tandem, using ice axes, walking in crampons and snowshoes, climbing over rocks, etc.